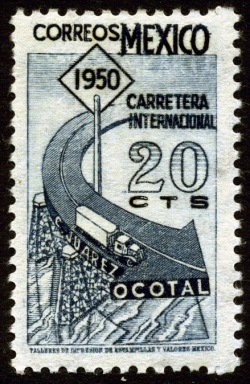 The completion of the Mexican stretch of the Pan-American Highway, from the US border to Guatemala, in the late 1940s was a significant turning-point in the development of Mexico’s road network. The highway made previously remote areas more accessible, but, far more than that, it served as a symbol of unity and Mexico’s progress into the modern era. Only a few years later, the total length of federal highways exceeded the total combined length of the country’s railway lines. As highway transport of freight and passengers took over, rail transport never fully recovered. To celebrate the opening of the Pan-American Highway, in 1950 a major road race was organized: the Pan-American Race (Carrera Panamericana). The race was held annually until 1954, after which authorities claimed that it had achieved the desired publicity. Actually, the race had achieved considerable undesired publicity as one of the world’s most dangerous road races, 27 people having lost their lives in five years the race was held. The race was revived, but as a modern, shorter version arranged as a stage rally for vintage cars, in 1988. The 2011 race has just finished. “The 3114 km Mexican road that stretches south to north from Tuxla to Juárez is, according to Alfred Neubauer [a legendary Mercedes-Benz Competition director], a combination of Tripoli’s Grand Prix, the Italian Mille Miglia, the German Nurburgring, and the Le Mans 24 hrs…. The race begins in a tropical climate where the temperature is high and humid and continues along a road that goes from sea level to a suffocating 3000 meter altitude! Temperature variations go from 34 Celcius to almost 2 degrees above freezing in just 72 hours… Carburetors and spark plug selection need alterations every 160 km approximately. Motors that ran miraculously at 1000 mts sounded almost dead at 3000…. The current road network in Mexico is extensive, covering virtually all areas of the country. Mexico has over 120,000 km of paved roads, far more than any other country in Latin America. By contrast, Brazil has about 96,000 km. There are over 10,000 km of controlled access toll expressways (even if they are among the most expensive in the world!). There are an additional 10,000 km of free four lane highways. Mexico also has over 200,000 km of unpaved roads. Veracruz: one of Mexico’s most diverse states Where are the wealthiest households in Mexico?